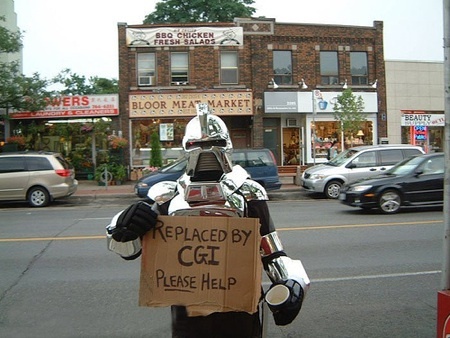 The humor of this picture depends in part in knowing that the character panhandling is an older version of a Cylon, the robotic overlords from the original series of Battlestar Galatica. In the new re-done version (which is great) the Cylons are rendered in Computer Graphics, of course. But you don’t even need to know that. Aren’t we all be replaced by CGI?